Mrs. Rogers was admitted to The Riverside from Lenox Hill Hospital on the 2nd of November 2018. Prior to being admitted to The Riverside, Mrs. Rogers had a history of poor balance. While walking inside her apartment on October 18th, she lost her balance and fell. Despite falling, over the course of the next few days she continued to walk with poor balance, and inadvertently hyperextended her leg, causing further damage. She exacerbated her leg and sacrum to the point which she was unable to walk. Mrs. Rogers was admitted to Lenox Hill Hospital on October 30,2018. Medical staff monitored her status over the course of 3 days. Upon admission to the hospital, she was experiencing a pain level of 10/10. The team at the hospital informed Mrs. Rogers that she will need Physical and Occupational Therapy in order for her to recover and return back to her daily life. When the hospital social worker approached Mrs. Rogers with a list of skilled nursing facilities, Mrs. Rogers chose The Riverside. Her journey to recovery began on November 2, 2018. Upon arrival The Riverside Rehabilitation Center, Mrs. Rogers was greeted by the friendly staff on her unit. Various team members stopped by to introduce themselves and to welcome her to the community. Mrs. Rogers was well aware that the road to recovery was going to take some time. Upon her arrival to The Riverside, she expressed a tremendous amount of pain scored at 8 out of 10. To help with the severe pain, the team at The Riverside called upon their pain management team to evaluate and create a plan of action. 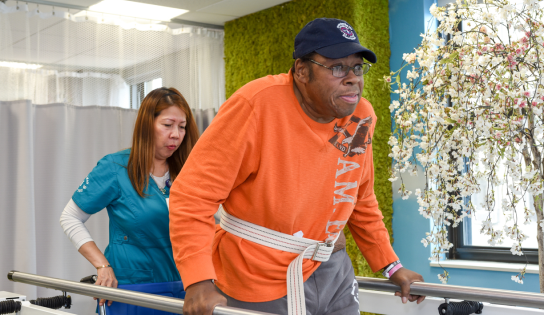 With the pain management team setting a course of action, the therapy team prepared a customize therapy regiment that would enable her to regain her strength without causing excess pain. Her first evaluation scores were collected. Well needless to say Mrs. Rogers did win, and was not letting anything stop her from practicing. On the day of her discharge, the discharge planner approached Mrs. Rogers to arrange transportation for her discharge. Mrs. Rogers declined to take any car service home. With the therapist, and medical staff giving her the green light she chose to walk home from the Riverside on her own! She walked out of The Riverside completely independent other than the use of a cane. At home she was expecting to meet a fan fare of 2 very happy cats who she missed dearly. Keep walking Mrs. Rogers!